Cheap Personalized Aluminum Whistle Keychains, Laser Engraved in Bulk or Blank. Promotional, Lowest cost in the USA and Canada. 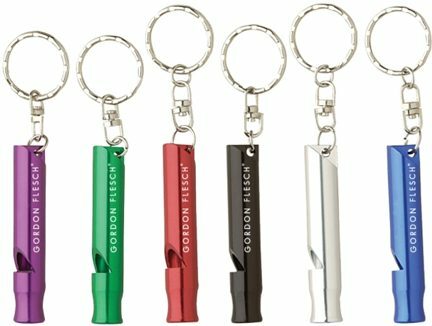 Sturdy bulk personalized aluminum whistle keychains, laser engraved with your logo or message. Our top quality whistles are ideal for sports, personal safety, etc. We also supply blank (not imprinted) aluminum whistle keychains at EQP (End Quantity Price). Budget Prices in USA and Canada for wholesale aluminum whistle keychains . American clients pay no taxes. We will send you a proof for your approval before production. Typical Production Time: 5 days after art approval. Rush Production is available: Contact us. Blank (not imprinted) whistle keychains ship next day. Price includes laser engraving in Silver on one side. We also supply wholesale blank (not imprinted) aluminum whistle key holders at EQP (End Quantity Price).